I think that there’s no doubt in anyone’s mind that children are great at imitating other’s behaviour. My children have mannerisms that are the exact copies of mine. I’m sure you’ve seen your own children copying what you do. What I find cute, year after year in teaching young children, is their imitation of me as their teacher. Without fail there is always a child standing at my whiteboard playing teacher, doing and saying the exact same things that I do and say. It’s remarkable to see. With this knowledge in mind, here are some things you could do to take advantage of children’s ability to imitate. 1. Behave the way you want your children to behave. Be the role model and show without telling them how to behave. 2. Talk politely. 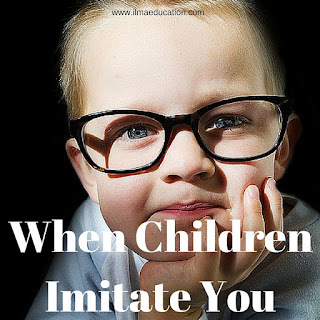 Children imitate your words as well as your actions. Don’t talk bad about others or use swear words. 3. Be consistent. The behaviour that children constantly see will be the ones that are copied the most. Thanks for bringing that up, that's an excellent point. We have to be sure that we are consistent in our actions and in what we say. Very important.